Is multifamily’s future in ‘transit communities’? The Commercial Brokers Association is proud to host the 15th Annual Commercial Real Estate Insights breakfast for the commercial real estate community. 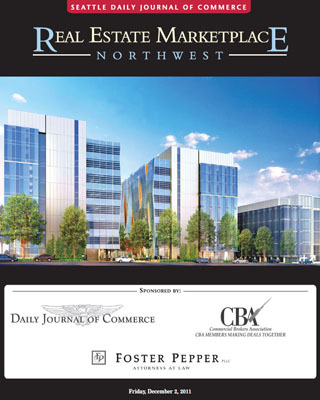 Insights is co-hosted by the Seattle Daily Journal of Commerce and Foster Pepper PLLC. It brings together experts from different external sources to review their impact on the commercial real estate sector in the near and mid-term. This year's speakers — Blake Eagle, Jerry Yudelson and Rob McKenna — are experts in three areas fundamental to commercial real estate: research, sustainability and government. Rob McKenna is serving his second term as Washington’s 17th Attorney General. As the state’s chief legal officer, he directs more than 500 attorneys and 700 professional staff providing legal services to the state agencies, the governor and Legislature. Blake Eagle founded the National Council of Real Estate Investment Fiduciaries (NCREIF), a Chicago-based nonprofit commercial real estate industry association. Jerry Yudelson is the author of 12 books on green buildings, water conservation and green development. “Greening Existing Buildings,” a guide to implementing the LEED-EBOM rating system, was published in 2009, and has become the must-have reference for converting existing buildings from standard to LEED-certified status. Vulcan Real Estate is developing the third phase of UW Medical’s research campus in South Lake Union. Copyright © 2011 Seattle Daily Journal and DJC.COM.